1. To make the jam filling, put the blackberries, apple, sugar and lemon juice in a pan over a medium heat. Stir and cook gently until the sugar has dissolved, then bring to a boil and bubble for 10-15 minutes. Take off the heat and leave to cool. The jam will look runny, but will firm up as it cools. 2. Preheat the oven to 190°C, gas mark 5. Brush the holes of a 12-hole muffin tin with 1 tbsp melted butter; leave the rest of the butter to cool slightly. Put the tin in the oven for 5 minutes to heat (not necessary if using silicone). 3. Beat together the yogurt and eggs, then stir in the remaining butter. In a large bowl, mix together the flour, 200g caster sugar and a good pinch of salt. Stir the wet ingredients into the dry, mixing well to remove any lumps. 4. Remove the muffin tin from the oven. 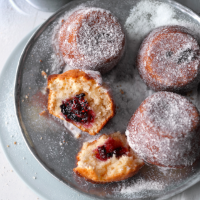 Fill each hole 2/3 full with batter, then spoon over 1-2 tsp blackberry jam and cover with the remaining batter. Bake for 15-20 minutes until golden. 5. Cool the muffins in the tin for 2 minutes, then turn out and roll in sugar. Cool a little before eating.